Victoria Bowling Club » Well done Lisa! You are here: Home » Blog » Competitions » Well done Lisa! 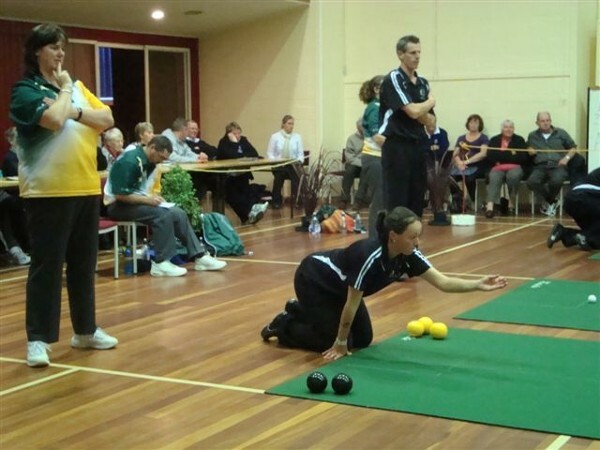 A very big well done to Lisa White in her debut Test appearance for New Zealand against Australia in the indoor bowls test series played in Balclutha. Lisa came through incredibly well winning the Womens Singles Australasian medal on a countback of ends (1 win, 1 loss and 1 draw), and the Womens 8-bowl Pairs Australasian medal with Fiona Wilson (Tauranga) 2 & 1/2 matches to a 1/2. Unfortunately Australia retained the overall Trophy after match points were drawn 33-33 after a great fightback from New Zealand on the final day. The women’s singles between new cap Lisa White, Upper Hutt Valley and Monika Korn, New South Wales was a titanic struggle. On the first day Korn got away to the best start but White fought back going down 19-21. On the second day with White’s nerves more settled they fought out a 15-15 draw which meant that White needed to win by three points on the third day to win the Australasian title on a count back. However in a great match White appeared to have the title in hand when she led 24-17 with two ends to play in the 25 end game. Korn refused to lie down and scored a two and three, White winning the match in identical style to day one 24-22. So it went to a count back on ends with White having scored on one more end than Korn 38-37 to win the medal. In the women’s pairs Lisa White combined with skip Fiona Wilson, Tauranga to once again shine. Both players have represented the North Island as a combination for some years. They drew the first game against Monika Korn and Julie Zaporozec 17-17 then scored a narrow 19-18 win on the second day and finished with a convincing 19-3 win to win the Australasian medals.